Here's something beautiful about South Africa: the country took a day commemorating an apartheid-era massacre (the Soweto Uprising of 1976) and turned it into a day honoring the future: the country's youth. As I've written before, I can't help but be inspired by the ability of this country to transform itself, however slowly and fitfully (and yes, it is slow and fitful). It's this spirit I invoke when I wake up every morning to do my job building codeX, our startup training the next generation of African software developers. I've written of our recent progress here, so I want to take this space to share another side of the story. At codeX, our young talent often comes from circumstances created by the long legacy of one of the most oppressive regimes the world has ever seen. They are mainly poor, live in townships, have precarious support systems, and live one step away from the crime and violence happening all around them. The most obvious example of the odds our coders are up against is how hard it is to simply get to codeX every day. Transport, disproportionately expensive for the poor because the concentric structure of apartheid cities forced non-whites further and further away from the city centre as their skin got darker and darker, is actually one of the main blockers to improving diversity in the tech ecosystem. Even if you are determined and switched on enough to know what's happening, you can't participate in that hackathon, networking event, or speaker series if you simply can't afford to get there. Our coders often travel hours each way (especially when the MetroRail train, aka MetroFail, is delayed) to get to our office every day. Most of them take out loans from us with the faith in themselves that their job prospects as developers are bright enough that they'll be able to repay the loans. People ask us why we even put ourselves in the city instead of a township, to be closer to the community and solve this transport problem. I have several answers for that. First, we want young people from all over the area to have the opportunity that codeX provides. If we put ourselves in, say, Khayelitsha, the coders from other townships would have an even harder time getting there, as transport was only designed to get people into and out of the city, but not between townships. Second, codeX grooms people for real employment, right away. Commuting is going to be part of life soon; might as well be now, so people learn how to manage their time and deal with the uncertainty of South African transport. 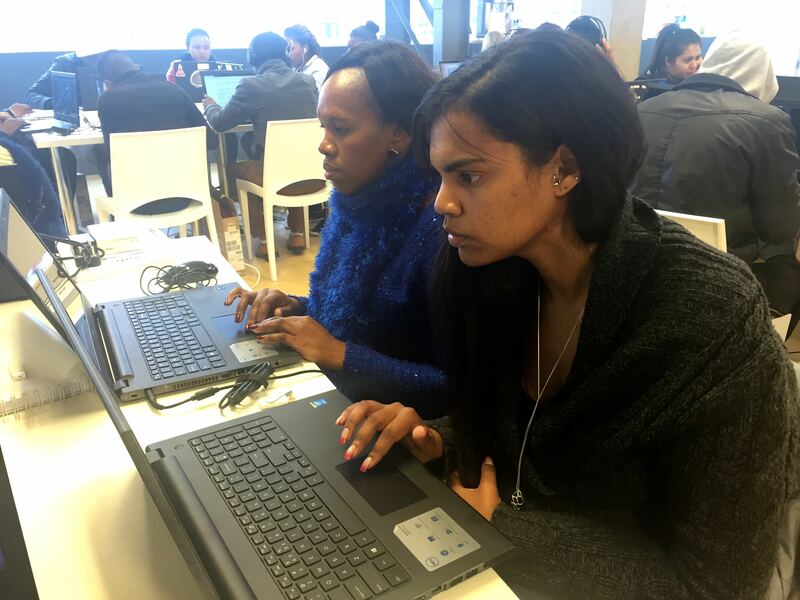 Third, coders say over and over that simply getting out of townships during the day opens one's eyes to a whole new world they wouldn't otherwise see. We layer onto that the opportunity of being in a world-class tech hub with events happening and brilliant people coming through all the time. Our coders give back to their communities without any prompting from us. 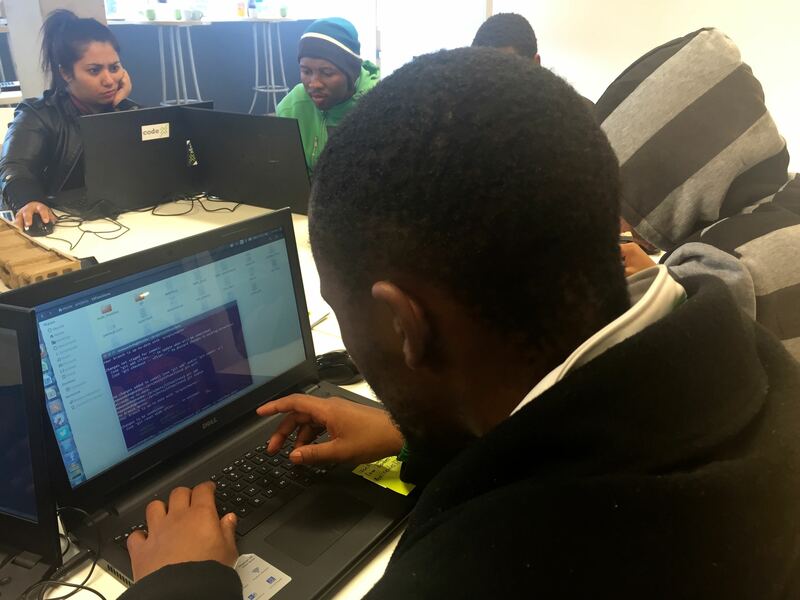 They mentor new applicants and kids at our partner organizations in townships like Brothers for All in Langa, and even help prisoners learn to code. They lead standups and teach people how to use Kanban boards. They build apps to solve problems they experience in townships, like inventory management for small business owners, registering kids for a school with no online presence, and increasing efficiency in the minibus taxi industry. We want to encourage this back and forth and knowledge transfer between our coders and their communities, and around the various tech hubs in townships, like our friends at LEAP schools in Pinelands, RLabs in Athlone and the Barn in Khayelitsha. As our coders become role models in their communities, we believe that more and more young people will mobilize themselves to realize their own potential, be it in tech or elsewhere. So we've started to develop the concept of an I-Loop, or Innovation Loop, a bus or taxi route between the various innovation and tech hubs around Cape Town and various locations in townships, with the idea that young talent with limited means ride for free and visitors get to interact with them and also get a tour of the rest of our awesome ecosystem. I see the transport issue as a solvable problem. Not easy, but solvable. I'm lucky to be in a position with my work on Silicon Cape to at least attempt to bring together the right group of people to attack it. If you want to get involved, please get in touch! But here's the other question that keeps me up at night: how do we make sure our brilliant young coders don't get derailed by the poverty and violence they encounter in their daily lives outside of codeX? This has really hit us in the last few months. 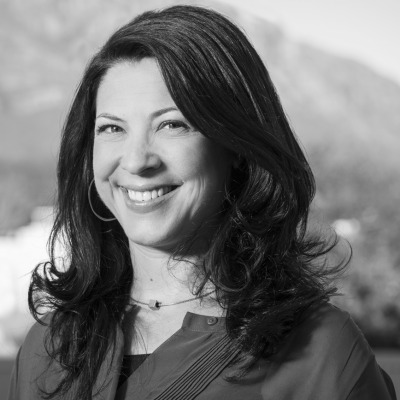 Surviving sexual assault. Mourning the murder of an immediate family member. Caring for sick children with no resources. Sleeping on the floor of a shack you share with 9 other people. Getting your arm broken by a drunk relative. It doesn't end. Most of the time, our coders manage to show up every day and concentrate on building software. It is utterly humbling. The regular, often casual violence our coders are subject to can't be solved by creating a working group. I don't have an answer. I have band-aids. We're looking for a social worker. We structure our program so Fridays and Mondays have more independent work, since once in awhile someone can't get back from a funeral in the Eastern Cape. We're understanding about what goes down, and know our people aren't truants or lazy when they don't show up for a day. They know they're the ones who suffer when they miss precious time at codeX. But when someone can't concentrate and eventually tells us that he still can't sleep at night because 3 months ago he was attacked in his bed and his head bashed in by a brick, what can we do? When he stops coming in and we call him 10 times, ask the other coders to try to reach him, and he says it's "a family problem," and never comes back, there's another talented young brain lost to the legacy of one of the most inhuman systems in history. These are people I have personal relationships with, people my company has invested in. When I think about the millions of other people, people I see on the street every day, who have these same experiences and no support system or chance at a better life, it can feel totally overwhelming, like there is no solution. But still, it doesn't make me give up. It makes me double down on treating our coders as whole people, and making sure we do everything we can to get people across the very long bridge between where they come from and where they're going -- and back again, at will. They have to do the walking on their own, but we can make sure the bridge is sturdy and strong, and equipped with guard rails, so they're less likely to get swept off by these hectic Cape Town winds. There's a lot going wrong in South Africa. A plummeting currency, a failing electrical grid, rising tides of xenophobic and gang violence, a population slowly giving up hope that the party that brought freedom can also bring opportunity. But when I look at our young people and see what they're made of -- and what they're building with those passionate and compassionate minds of theirs -- I'm not just hopeful for the future. I'm inspired. Happy Youth Day.